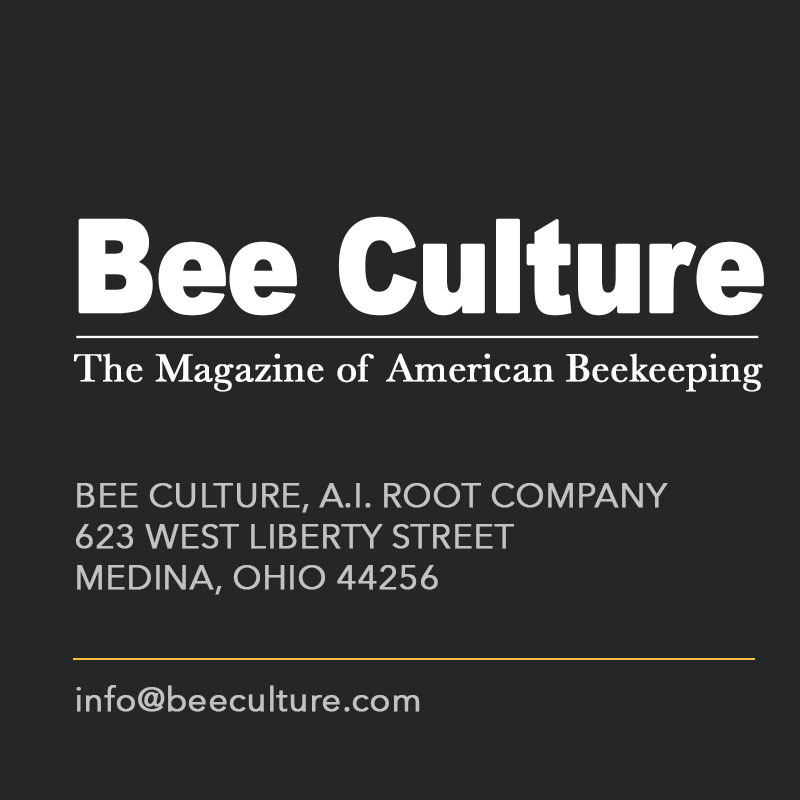 This past Spring I slipped across the Indiana border and heard you speak at a beekeeping school in Ohio. I attended both of your talks, enjoyed them very much, and I learned a lot. During your talk on reducing colony loss, you emphasized controlling Varroa mites. 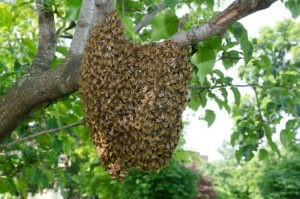 I realize that I am one of those beekeepers who lose way to many hives each year. This Winter I lost half of six, and this was a better year. I’m getting tired of buying new packages each Spring, and my wife is paying more attention to the checks I write. During your talk you briefly discussed monitoring for Varroa, and threshold numbers. Could you give me recommendations on the best monitoring method to use, and as you said “the numbers please’? I commend you for wanting to learn more about the monitoring and control of Varroa mites. 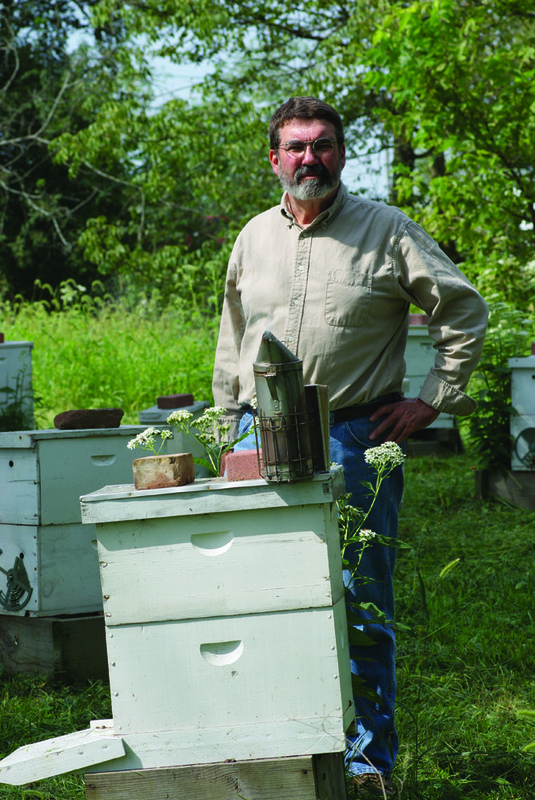 When I was the Kentucky State Apiarist, each spring brought nice weather, nectar in my honey supers, swarms in the trees, and calls from beekeepers asking why their bees had died. 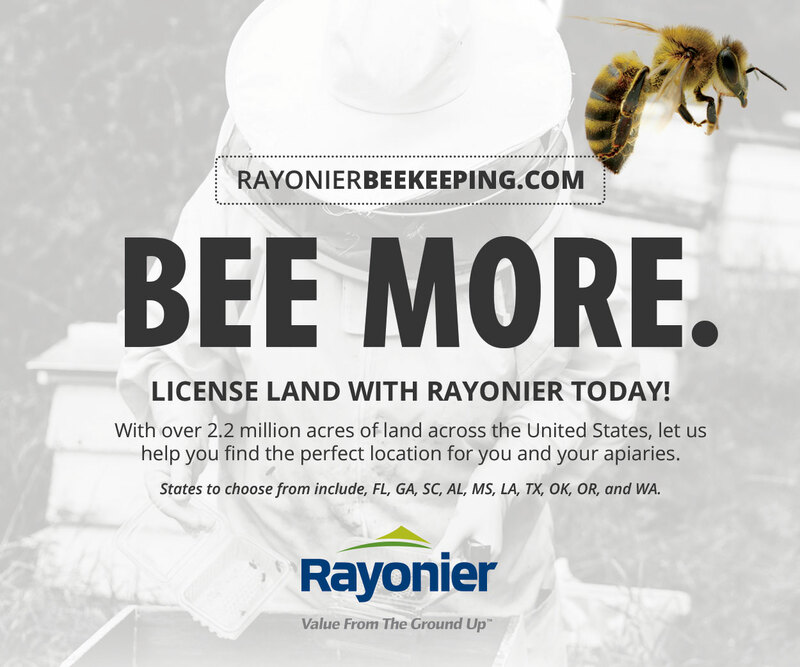 Now that I’m retired from the state, I no longer get the phone calls, but the same question comes up at beekeeping meetings and in my email. In attempting to diagnose the problem, I use a standard series of questions. First, “What did you do last year to control varroa mites?” Most of the time the answer is, “Nothing, I don’t have a mite problem.” Next I ask, “What monitoring method did you use to determine that?” I usually don’t get to my third question, regarding the results of the monitoring, because beekeepers who sustain heavy losses typically have not monitored at all. They formed their opinion based on the fact that they did not see many mites on the adult bees in their hives. Other bee inspectors and apiculture extension specialists I talk to tell me that they ask the same questions and, far too often, get these same responses. I considered, and still consider, this indifference towards monitoring and treatment of Varroa mites self-defeating if beekeepers hope to keep their colonies alive. There is no doubt that Varroa mites are the most important factor in colony loss. I have more than once heard a beekeeping researcher say that if we could magically make Varroa go away, colony losses would drop dramatically. I spend a lot of time these days talking to commercial beekeepers, and invariably find that they work hard to control Varroa. 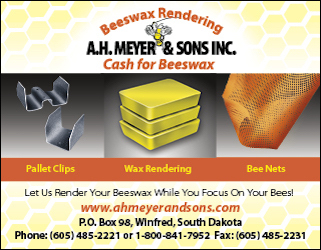 Ironically, recent surveys show that over 60% of small scale beekeepers do not treat or even recognize when they have a mite problem. 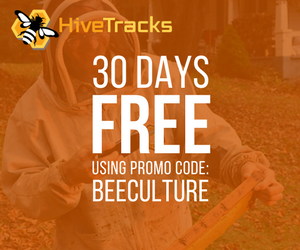 In the early 1990s, our only tool for fighting Varroa mites was the application of a very limited number of chemical control products through a method that we called “treating by the calendar.” Taking for granted (usually correctly) that they had a Varroa problem, beekeepers applied a chemical miticide in the early Spring, and again in the late Summer or early Fall. The problem with the routine, repeated application of a limited number of miticides was that Varroa quickly became resistant, initially to fluvalinate (brand name Apistan), the first effective chemical product labeled for control of Varroa, and then to coumaphos, the active ingredient in CheckMite+. In the meantime, researchers were devising procedures to count mites in a scientific sample of bees in order to give beekeepers a quantifiable standard to use in determining when an infestation represented a low level threat versus one severe enough to require treatment. The idea was to extend the period of time between treatments, and to limit applications to those which were truly necessary, all in an attempt to retard the development of resistance. Systematic procedures are necessary because assessing the level of a Varroa infestation is just not as simple as pulling a frame of bees and counting mites. 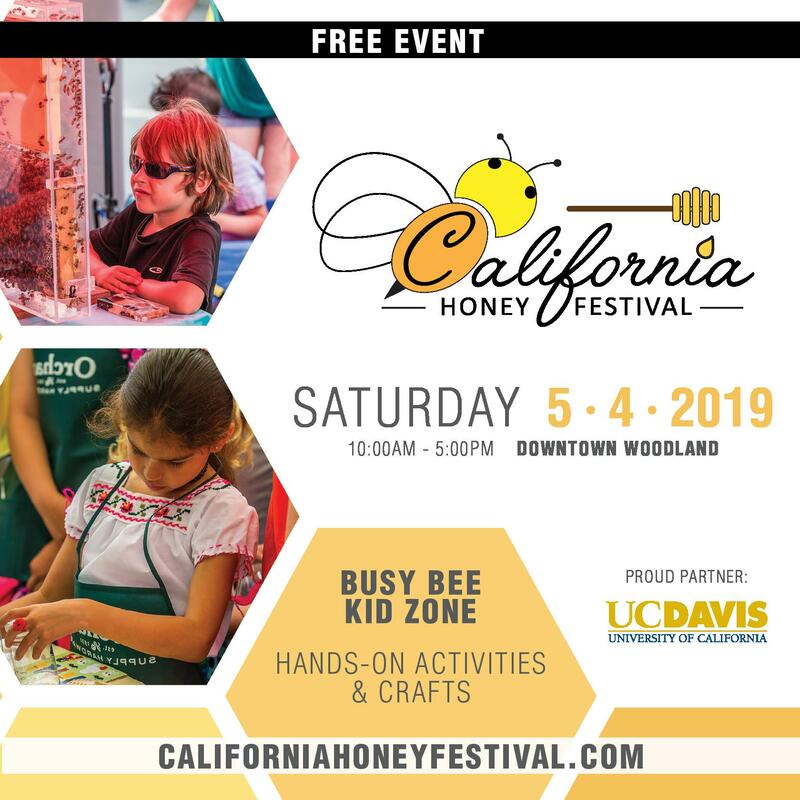 First of all, it’s one thing to identify tiny mites on an enlarged photo of a bee in a book or power point slide; it’s quite another in a roiling mass of bees in a living colony. Also, most mites are not found on adult bees to begin with. During periods of intense brood rearing, as many as eighty percent of the Varroa in a hive are sealed inside brood cells, reproducing on bee pupae. Shake bees from two brood frames into a bucket or pan, making sure that your queen is not among them. 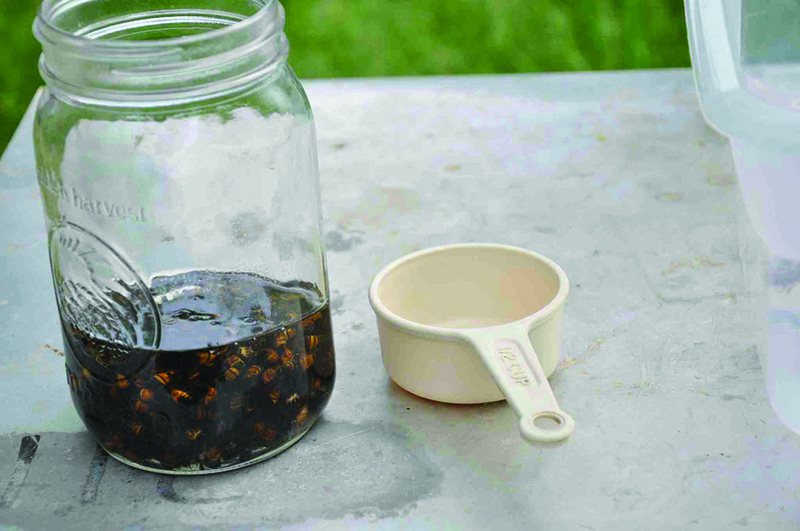 Scoop up 1/2 cup of bees and dump them into a jar – a wide month quart fruit jar works well – which contains enough alcohol to submerge all of the bees. Soapy water can also be used, but I prefer alcohol. Put a lid on the jar, and shake it for one to two minutes. 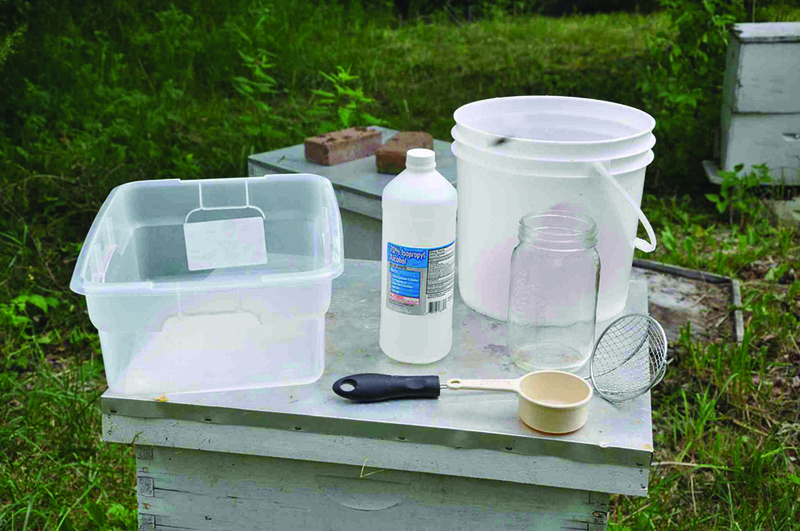 Place a sieve over a small white plastic bucket, and pour the bees and alcohol into the sieve. The shaking dislodges the mites from the bees, and they end up with the alcohol in the bucket. Brown mites are clearly visible in a white bucket. Repeat the wash by moving the dead bees from the sieve to the jar, adding more alcohol, shaking, and dumping them into the sieve again. Some experts suggest repeating this step until no additional mites are seen in the alcohol under the sieve, but definitely do it at least one more time. Count the mites in the liquid, and the bees in the sieve. 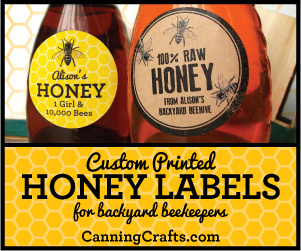 Many beekeepers make use of the approximate equivalence 300 bees to ½ cup volume, but I suggest doing an actual count, at least the first couple of times that you conduct an alcohol wash, in order to get a feel for what that many bees looks like. To convert the raw numbers into useful information, divide the number of mites by the number of bees and multiply by 100. For example, six mites out of a sample of 270 bees would be 6/127 = 0.022 and 0.022 x 100 = 2.2, which represents the number of mites per 100 bees. That number is compared to a recommended threshold, the number at or over which intervention (meaning chemical treatment) is required lest the colony decline and eventually suffer high bee mortality. Thresholds are not constants. In recent years, due to increased colony loss, they have become more conservative, meaning revised downward. They also change with the seasons. Spring to early Summer is a time of maximum brood production in honey bee colonies, and therefor an ideal time for the population of Varroa mites, which reproduce in brood cells, to increase rapidly. Because Varroa can get out of hand so quickly at that time of year, a lower threshold is used in the Spring. The bottom line is that failure to monitor, and to control Varroa when threshold numbers are exceeded, means an increased likelihood of a dead colony later in the season. It’s best to monitor twice a year, in Spring and Fall. The following are the thresholds I recommend using for an alcohol wash sample. They are consistent with the numbers suggested by researchers. A powdered sugar roll is a monitoring method similar to an alcohol wash, in that mites dislodged from a sample of bees are counted to arrive at an estimate of the number of mites present per hundred bees. The difference is that the bees are rolled, not shaken, in a jar with powdered sugar instead of alcohol. 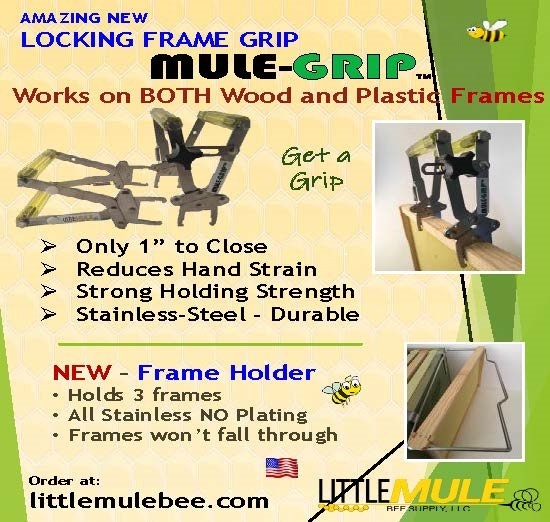 Some beekeepers prefer this method because it is non-destructive, i.e. it does not kill the bees. However, this method is not quite as effective at dislodging Varroa, and gives less consistent results. Beekeepers conducting powdered sugar rolls should reduce the above thresholds by one. If you ask me, I can refer you to more detailed directions for conducting a powdered sugar roll. 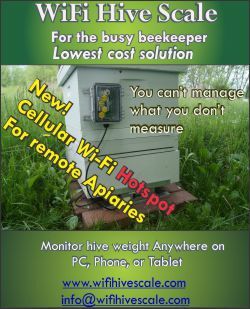 In my “Ask Phil” column in the August 2013 issue of Bee Culture, I discussed monitoring with sticky boards. If you would like a copy of that question/answer, let me know. Sticky board monitoring exploits the fact that a few mites are continually falling from honey bees in the hive as a result of the bees’ self-grooming. Some view this method as giving more accurate results since it collects mites from the entire hive instead of from a sample of a few hundred bees. In brief, in a sticky board survey, a sheet of cardboard or rigid plastic coated with vegetable shortening or oil is inserted beneath the brood area of a hive, often under a screen bottom board. The fallen Varroa mites are trapped on the board and counted to determine how many accumulate during a 24 hour period. 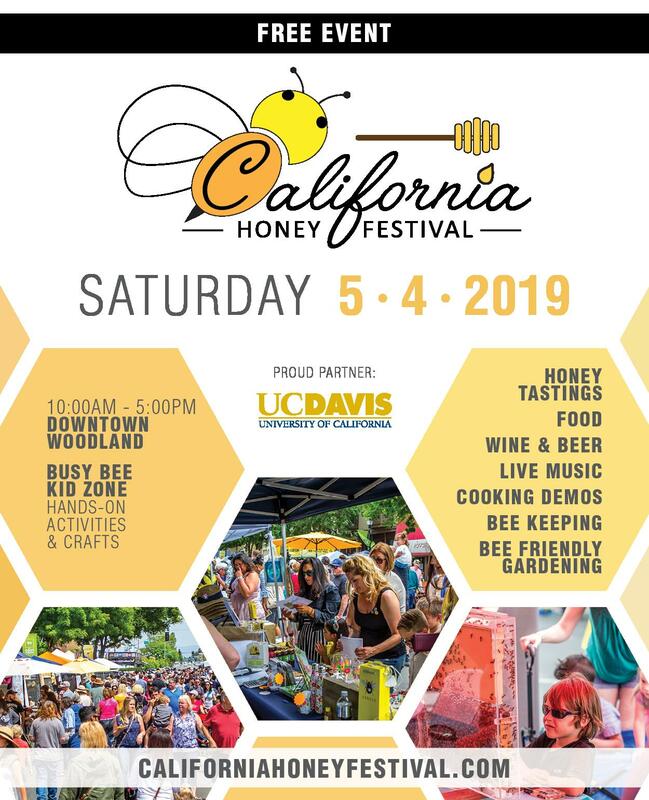 However, these results are difficult to interpret, since thresholds will vary with colony size, time of year, and geographic location of the hive. As a result, I suggest using one of the other monitoring methods. 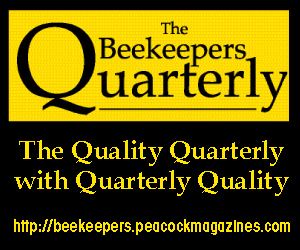 The recommendations of beekeeping experts change over time in response to changing circumstances and new research. 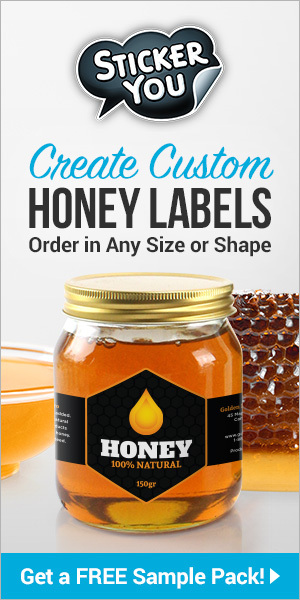 After the devastating losses from Varroa which began in the late 1980s, the advice was to treat, treat, treat as soon as a labeled product became available. Back then, treating by the calendar saved many colonies. When resistance began to develop, researchers feared that our sole weapons against Varroa were about to become ineffective. The message changed to treat only when necessary, and monitor to determine when it is necessary. Considering the statistics about the number of beekeepers who neither monitor nor treat, perhaps that message has become garbled over time. Some seem to have interpreted “treat only when necessary” as “not necessary to treat.” Perhaps monitoring seems like too much work compared to the simpler alternatives of treating on a schedule or not bothering to treat at all. 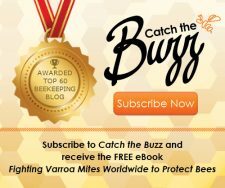 Perhaps beekeepers who have come to the craft in the last few decades aren’t aware of the effect Varroa had when it first arrived on this continent and of how it earned its full name, Varroa destructor. 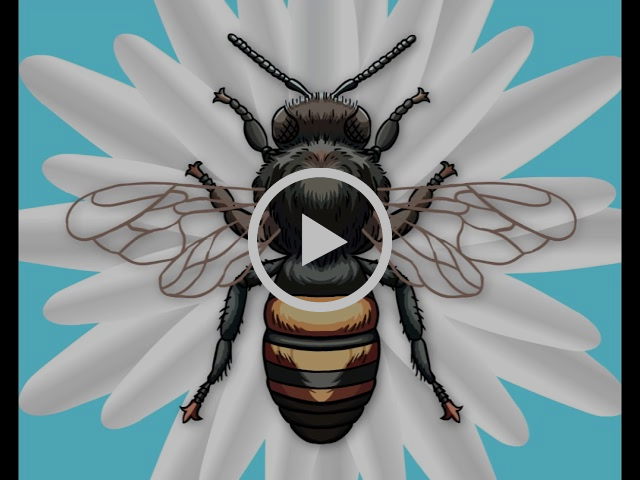 Whatever the reason, every year, beekeepers all over the country lose colonies to mites and the viruses of which they are carriers, and they never know what hit them. They blame pesticides, or CCD, or habitat loss, and sometimes those really are causes, or at least significant factors. However, too, too often, the underlying cause is a lack of effective management which allows a mite infestation to overwhelm a colony or weaken it the point that it succumbs easily to other stressors. The most frustrating thing about these losses is that they don’t have to happen. There are now several products available for fighting varroa to which there is, so far, no resistance. 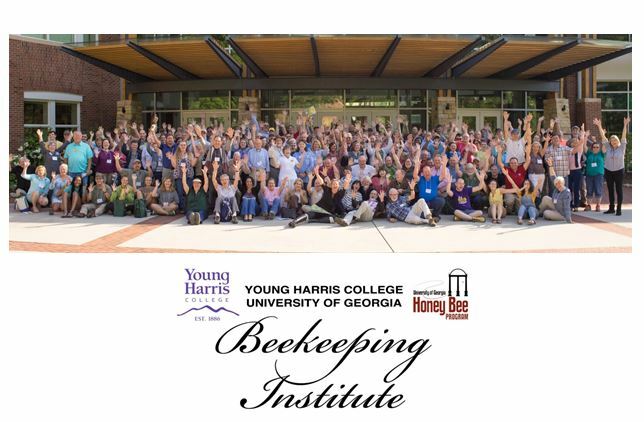 When I’m invited to speak to beekeeping groups across the country, I provide them with a list of talks I have pre-prepared and sometimes I develop a presentation on a new topic at their request. Often I’m told that the members are tired of hearing about Varroa mites and want something different. The reason I continue to talk, and write, about Varroa is that so many people still don’t seem to have gotten the word. I enjoyed your column, and web pages! I have a question My bees have been swarming at an unusual rate this year even though I have added supers to give them space it hasn’t stopped them. This got me to wondering if I made a device to go in the box opening that would exclude queens and keep her from leaving the hive. Then I could just put that on the opening when this swarming starts to happen and the bees would have to stay in the hive. Later it could be removed. What do you think? It might work for a while, but not for long. When a colony is in what I call swarm mode, they are following a powerful instinctive urge, and it is extremely difficult for a beekeeper to prevent them from doing so. A sure sign that a hive is preparing to swarm is the presence of numerous queen cells – typically over half a dozen – and more than 15 is not unusual. Swarm cells can be distinguished from supersedure cells because they are normally built on the bottoms of frames, whereas supersedure cells are usually found higher up, closer to the middle of the frame. However, I don’t worry so much about where the cells are located; I just notice the numbers. Fewer than five cells probably indicates that the bees are preparing to replace an old queen, or supersede, rather than swarm. By the time you notice numerous swarm cells in a hive, the colony is already well along in the swarm process. I don’t know any beekeepers who have tried making a device to exclude queens at the hive entrance, but the general idea of restricting access to the entrance in order to prevent the queen’s leaving with a swarm is not novel. It is usually accomplished by placing a queen excluder under the bottom brood box. It sounds plausible – if the old queen can’t leave, the swarm won’t either. However, a determined queen might be able to squeeze through a queen excluder, and if she cannot, the swarm will depart anyway with the first of the (smaller) virgin queens to emerge. Another swarm prevention strategy based on the same premise is clipping a queen’s wings to keep her from flying with a swarm. Of course, that doesn’t work either, for the same reason. However, using a queen excluder (regardless of where it’s placed) to restrict the entrance is not only ineffective, but also potentially harmful. Every day drones, which are larger than workers, will attempt to fly, be caught in the queen excluder, and die, clogging the excluder as they do. If this happens to the extent that it inhibits ventilation in the hive, it can cause overheating. It is almost impossible to prevent swarming all together, but there are some simple things we can to do to reduce it to some extent. One is to keep young queens in our hives. Colonies tend to swarm when the brood area becomes congested and overcrowding reduces the bees’ ability to sense queen pheromone. Because young queens produce more pheromone than older ones, the effect will be less pronounced and the bees less quick to swarm. The most effective preventative action that a beekeeper can take is making nucs in the early spring, prior to the production of swarm cells. This creates space in the brood nest, relieving congestion there. Moving empty comb from a brood box’s perimeter to the center of the area where brood is being reared may also help. Adding honey supers is another way to create more space, especially when they include drawn comb directly over the brood area. When my hives are ready for supers, I put at least two with drawn comb on each hive, without a queen excluder. This allows the bees to extend the brood area into the supers if they feel a need to. If the queen wants to go into the supers and lay eggs there, that is fine with me. Normally, any brood that is produced in the supers will have emerged and those cells filled with honey before I’m ready to harvest. If not, I can always prevent further egg laying by placing a queen excluder under the supers a few weeks before I’m ready to take them off. I think that many new beekeepers are overly concerned about swarming, and maybe it’s the fault of us old-timers for talking so much about it. If there is a good nectar flow, and my hives are strong (both factors which trigger swarming), I can still make a good honey crop. If you regard the colony as a single social organism, swarming can be seen as the way that organism reproduces. 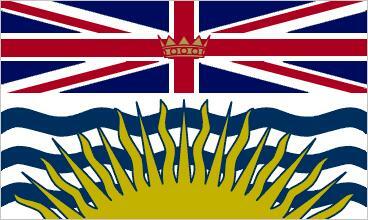 It isn’t meant to replace one colony with another, but to increase the number of colonies. Therefore, the process normally leaves the old colony with sufficient resources to rebound, rebuild the population, and still produce surplus honey. As I write this on May 10, several of my hives have swarmed, yet I have at least two full supers on each hive, and the best of the nectar flow is yet to come. There is honey to be made after a swarm departs.